A woman who was at her hairdresser’s getting her hair styled for a trip to Rome with her husband mentioned the trip to the hairdresser. A month later, the woman came in for another hairdo. 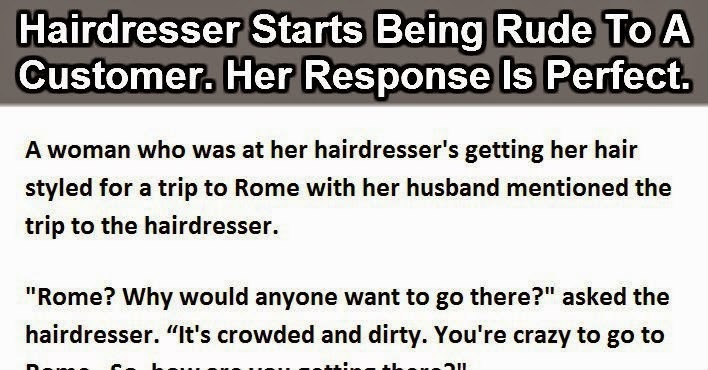 The hairdresser asked her about her trip to Rome . “Actually, we were quite lucky, because as we toured the Vatican , a Swiss Guard tapped me on the shoulder, and explained that the Pope likes to meet some of the visitors, and if I’d be so kind as to step into his private room and wait, the Pope would personally greet me.